It must be stated right from the outset that the outgoing year has failed to bring this long-suffering region either any perceptible change for the better or a consummation of aspirations that provided a powerful impetus to the million-strong protests in the Arab world seven years ago. The price of revolutions, failed hopes as well as outside interference proved too high. The Middle East remains a source of violence, terrorism and destructive processes sending shockwaves far beyond its borders. The yearend saw even some grave signs of escalating tension that gives no hope for an early outreach to constructive solutions. With the assassination of the former President Ali Abdullah Saleh, the conflict in Yemen has entered a new stage of aggravation. Libya, like Yemen, is in a state of half-disintegration. The confrontation between Iran and Saudi Arabia, despite numerous mediating efforts, is mounting. The attempts to involve Lebanon in this confrontation, though cut short in time by diplomatic means, are keeping the country, which went through its own civil war in the 1980s, in expectation of new internal conflicts. To no small degree, this is promoted by changes in the situation surrounding the Iran-supported Lebanese Hezbollah movement, which is under increased pressure from the US, Saudi Arabia and Israel. The military and political consequences of the independence referendum held in Iraqi Kurdistan have introduced elements of alienation in the already difficult interethnic and interfaith relations in Iraq, particularly between Arab and Kurd anti-ISIS allies. President Trump’s recognition of Jerusalem as the capital of Israel, a step that his predecessors consistently refrained from, has brought to a conclusion a long string of tumultuous events that make the situation in the Middle East increasingly explosive. Perhaps one of the few really felt positive results of 2017 is the rout of ISIS as a quasi-public terrorist entity, which in its heyday controlled an area in Syria and Iraq equal in size to that of Britain with a population of 9 million. Russia played a decisive role in the counterterrorist campaign. 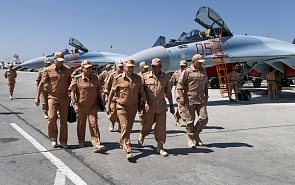 The timely and rapid entry into the Syrian conflict, at the request of the Syrian government, of the Russian Aerospace Forces and a limited ground support contingent has produced a breakthrough, particularly so this year. Russia’s interference and its appeal to the United States and its allies to form a broad antiterrorist coalition tipped the balance on the ground. Even though the coalition failed to come into being, the Western states had to take a more vigorous stand when it came to action in fighting ISIS in Iraq at the invitation of the Iraqi government and de facto in Syria, where its intervention had no base in international law. However, for all their rivalry, differences as to who is or is not a terrorist and mutual accusations Russia and the US, in effect, were working in parallel. The medieval state-building practices have been overthrown. The question is: what is next? ISIS has made international terrorism transnational in character. The ideology of jihad, one of the motive forces of terrorism, will not disappear of its own accord following the loss of the “caliphate.” Military operations involving bomb strikes and army units are no longer effective. As an organization, ISIS is as good as destroyed, but the surviving jihadists disperse like quicksilver and settle in areas outside of state control, which are still numerous in the Middle East. To all intents and purposes, the sociopolitical ecosystem, which has procreated ISIS, remains unchanged. The experience shows that the fragility of state institutions, or, on the contrary, the rigid monopoly on power and alienation from other national forces deprived of a chance to engage in politics, will generate internal conflicts. It is these zones of conflict that create synergy between violent extremism and jihadism. In this connection, we should dwell in particular on prospects for the developments in Syria as its internal conflict is transiting from the military stage to that of a political settlement. The new Russia-created military reality should be consolidated by forming a regime with a really inclusive base representing the interests of a broad spectrum of national and patriotic forces, including those of the Sunni majority. Otherwise the fruits of the military victory would be lost over time. The price of error in this regard is as high as on the battlefield. Considering the developments in the region, attaining substantial shifts in a Syrian conflict settlement on a coordinated international legal basis under UN aegis may generate positive dynamics in the Middle East leading prospectively to a collective regional security system.